Only two men retained an Olympic decathlon title in the 20th century, Britain's Daley Thompson and American Bob Mathias. The first to do it was Mathias, a clean-cut and self-confident all-American boy. In 1948, at the London Games, he became the youngest man to win an Olympic track and field title. In his boyhood, there seemed little likelihood of Mathias evolving into a sporting hero. He was anaemic and was prescribed iron pills, liver pills and frequent naps to conserve his strength. Yet at the age of 17, two months after graduating from high school and six weeks after competing in his first decathlon, Mathias had claimed the Olympic crown in London. It was the stuff of Hollywood, quite literally, as he and wife Melba went on to star as themselves in the 1954 movie The Bob Mathias Story. Mathias was a politician in later life, serving as a Republican in the House of Representatives from 1967 to 1974. His remarkable ascent from high school track and field star to Olympic champion within a matter of months began at the Southern Pacific Amateur Athletic Union (AAU) Games in Los Angeles. 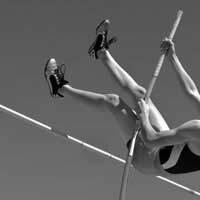 He had only three weeks to prepare for the event and had never competed in the pole vault, long jump, javelin or 1,500 metres. Despite this, he won and two weeks later at Bloomfield, New Jersey, he beat three-time national champion Irving Mondschein to become the surprise winner of the National AAU, which served as the American Olympic trials. Mathias, born in the small farming town of Tulare, California, was an unknown at the London Olympics, yet after the first day of the decathlon competition he was third of the 39 athletes. One of his favourite events, the discus, was still to come, and his throw of 43.99m, the best of the competition, put him in front. Light was failing in the London fog by the time of the javelin, the penultimate event. There were no infield lights, so cars were driven into Wembley Stadium and their headlights were turned on to illuminate the foul line. Mathias scored 7139 points and was 165 points clear of Frenchman Ignace Heinrich, the silver medallist. Mathias was the world record holder when he arrived in Helsinki four years later to defend his title. He did so in spectacular fashion, with 10.9 seconds in the 100m, a 6.98m long jump, 15.30m shot, 1.90m high jump, 50.2secs 400m, 14.7secs 110m hurdles, 46.89m discus, 4.00m pole vault, 59.21m javelin and four minutes 50.8secs for the 1,500m. He broke his own world record with 7887 points and finished a remarkable 912 points clear of team-mate and runner-up Milton Campbell. Mathias then retired from athletics having never lost a decathlon competition. He was an officer in the Marine Corps from 1954 to 1956, and, after leaving Congress, became a consultant to the President's Council on Physical Fitness. He was the first director of the US Olympic Training Center in Colorado Springs from 1977 until 1983, the year he was enshrined in the US Olympic Hall of Fame.